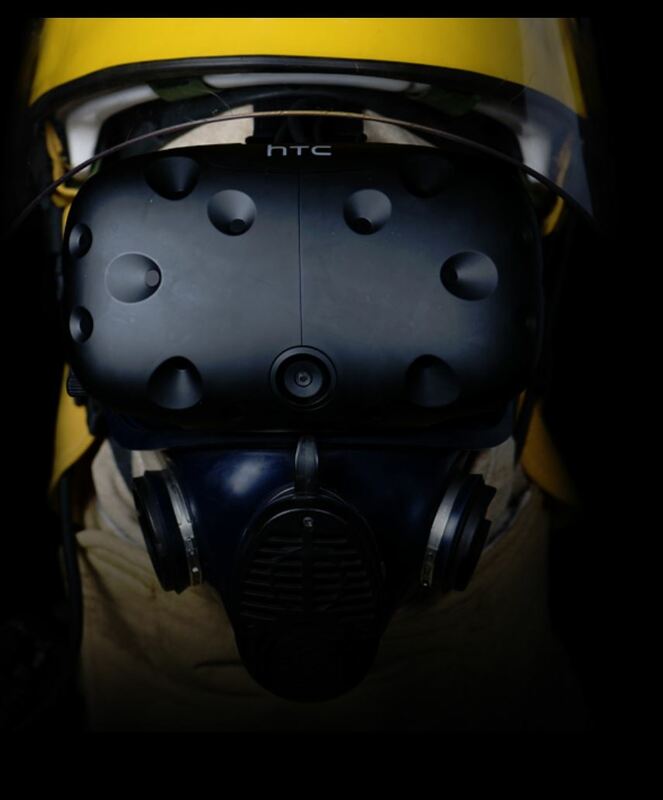 Rather than a simple Head Mounted Display (HMD) and motion controllers, the FLAIM system integrates the existing Vive HTC HMD into a full face-cover that replicates the breathing apparatus used by real firefighters. As a result, it doesn’t need to mimic smoke, as the closed-breathing system removes any externally inhaled smoke. This full-face mask is used in conjunction with a clothing system that includes heat generation components to mimic the harsh heat faced by firefighters. Called Hitoe, it’s described as a “a wearable, bio-sensing nano-fibre vest which tracks electrocardiogram (ECG) readings and transmits them in real time for fitness analysis of firefighters during training.” This allows trainers to monitor the exact physical condition of trainees during the simulated fire situations. The analytics platform was originally designed by Dimension Data to monitor the performance of athletes in the Tour De France cycle race, but has since been modified for use in the FLAIM system. As well as the Hitoe vest and simulated breathing apparatus, the system also includes a virtual water hose which uses haptic simulation to deliver force feedback, allowing the user to get a feel for the strength of the flow of water under different pressures. Further optional extras include hose reels with a higher jet reaction force, augmented reality and 360 degree video training solutions, and real time performance data visualisation. The entire cost of each basic training unit is $40,000; according to James Mullins, Associate Professor, Deakin University and Chief Technology Officer of FLAIM Systems, a single week of real-world “hotfire” training can cost up to $50,000. The reusable nature of the FLAIM system thus represents a substantial cost saving in comparison. It’s also fully portable, so can be used across an organisation’s various operations. It’s not intended to be a total replacement to real-world hotfire training though; rather it can reduce the preparation and length of hotfire training required to train a candidate, as well as increase the effectiveness of equipment familiarisation. During the training, data is captured via an analytics dashboard, and measures things such as smoke level, fire intensity, water jet reaction force and spray patterns. The system’s Hitoe bio-sensing tech also monitors how the firefighter is coping with the conditions, keeping track of the user’s heart rate, ECG and stress levels. This can then be used as a benchmark, to ensure the user is meeting required condition and fitness levels. According to Mr Mullins, the most difficult aspect in developing the simulation was accurately modelling the physical properties of fire, smoke, water and heat, which the system must do simultaneously, thus requiring significant computing power. While specifics weren’t given, the software runs on “high end PC systems”, allowing the company to use off-the-shelf components that are easy to upgrade and support. In future, the company aims to develop more scenarios that will be used as part of a subscription library, allowing customers to more accurately train for specific instances. There are also plans to add a first-aid component to the training system, as on-the-ground medical support is a huge part of a fire-fighters roles. As one of the most innovative VR training solutions found in the world, FLAIM again highlights Australia’s ground-breaking research in this field. Combined with other companies such as Opaque media, who are working with NASA on simulations, the land down under is well on its way to becoming a world leader in the field of VR.